I'm currently travelling in Laos where my favourite local dish is called "larb" or "laap" (ລາບ in Lao, ลาบ in Thai). When I described it to my Australian friend he said it sounded like a dish that was one of his favourites called "San Choi Bow" and described it as "either a southern Chinese or Vietnamese word for the spicy mince in a lettuce leaf". I've been hunting on Wikipedia and there appears to be no English article though I have now found a Chinese Wikipedia article and the term does show up in a couple of articles on the English Wikipedia. There is lots of information on the Internet, I noticed especially from Australia. But the information is contradictory. Two Yahoo Answers questions about its origins give different answers with no further details: China, Thailand. There's at least seven other spellings I could find, all combinations of "san" vs. "sang", "choi" vs. "choy", and "bau" vs. "bow". To me this looks like Chinese but I couldn't find the Chinese characters and even if the dish has a Chinese name that doesn't mean it wasn't originally from a neighbouring country. Could it be that "larb" is a Southeast Asian version of "sang choi bow" or is "sang choi bow" a Chinese name for their version of "larb"? It is written in Chinese as "生菜包", which in Pinyin is "shēngcài bāo", noticeably different to any of its usual spellings in English. However, in Cantonese it is "sang1 choi3 baau1". Much closer to the English spellings and pronunciation. Cantonese is mainly spoken in Hong Kong, a great culinary exporter and major influence on "Chinese food" in the west. 生菜 means "lettuce" and 包 means "wrap", etc. Of course it's still possible the dish originated outside Hong Kong, the name is very literal and isn't necessarily the original name of the dish. But it is clear it came to the English speaking world by way of Hong Kong. I can't give you exact origin of sang choi bow but it is certainly not from Thailand or any of its neighbouring countries. I found an article, the author has Chinese/Cantonese Singapore origin and she said she never taste similar dish back in her home country either. 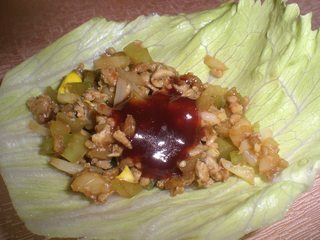 In Australia sang choi bow usually made from minced pork or chicken, stir fried with onion, shallot and various other vegetables, seasoned with soy sauce, oyster sauce and served with lettuce leaves. It is a common option for entrée (appetizer) in Thai, Veitnamese or Chinese restaurants. The dish also served as a second course for pecking duck (made from left-over meat). Different restaurant would have different variation of the dish. The only thing they have in common is, it will always come with lettuce. I could remember having similar dish from Chinese restaurants in Bangkok. It was also prepared out of left-over meat from peking duck but they never served it with lettuce. Sang choi bow is waaaaaay different to larb though. Larb is more or less a salad. 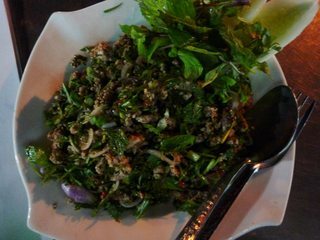 In fact larb beef in Australia is usually called Thai beef salad, although restaurants normally use sliced grilled beef instead of cooked minced meat. Larb also seasoned with fish sauce, chilli, and lime juice, never with soy or oyster sauce. Laab in Thai language is Verb mean to chop meat. We have Northern Laab and North-eastern Laab which the way to seasoning and taste are difference. 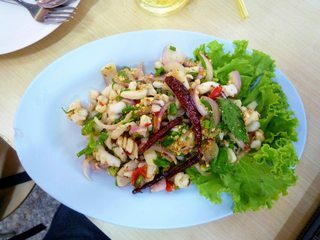 From your picture Squid larb is north-eastern style seasoning with dried chili, lime juice, roasted sticky rice, fish sauce, sugar. It's taste is sour come first then salty with a little sweet. It's normally spicy because Thai people put a lot of dried chili in it and they also add herbs: culantro, shallot, spring onion, mint leaf. Sang Choi Bow was originated from Guangzhou, China. As Sangchoi is lettuce in Chinese, and it pronounced similar like "To get rich" in Chinese. Not the answer you're looking for? Browse other questions tagged asian-cuisine chinese-cuisine thai-cuisine vietnamese-cuisine or ask your own question.